In starting to look forward to 2019, I’m focusing on health, happiness, and things that make life easier! Today’s Shortcut Chicken Fried Rice is all of those things. I often find that “better than takeout” recipes involve a ton of ingredients and all of my pots and pans. Don’t get me wrong, sometimes I feel like doing a kitchen project like that, and sometimes I just want dinner on the table. 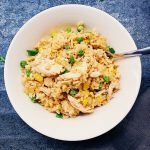 This Shortcut Chicken Fried Rice leverages rotisserie chicken (or really any leftover chicken) and leftover rice. I used brown rice which also helps on the health front. 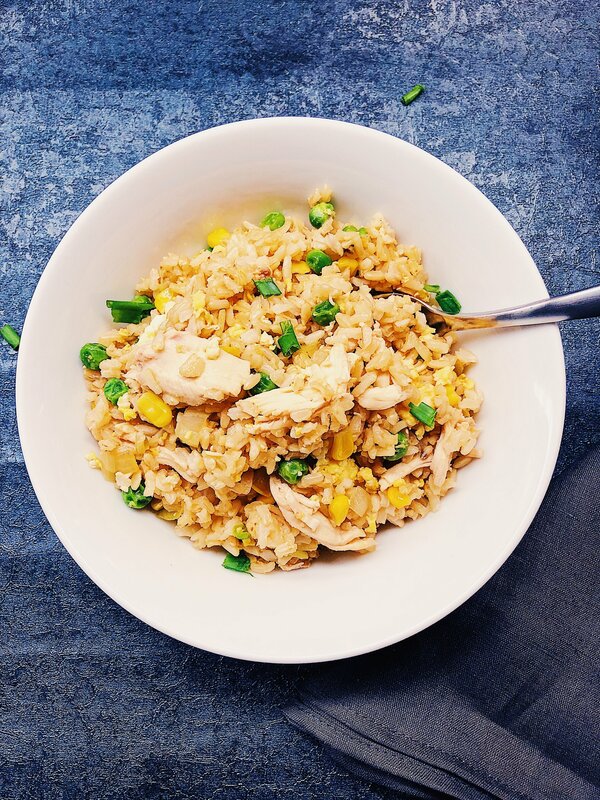 For those days when you are this close to ordering takeout, give this recipe a try! In a large skillet, heat the sesame oil and olive oil over med-high heat. Add the onion and sauté for 2 minutes. 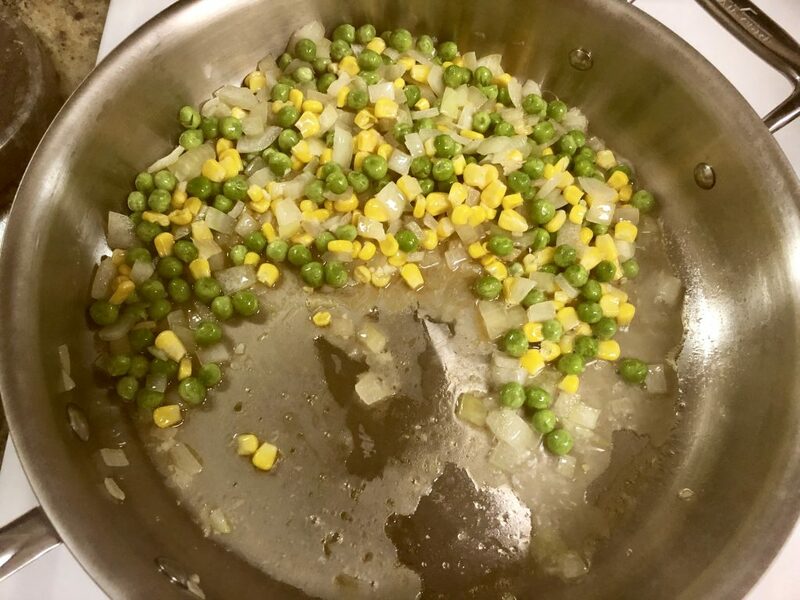 Add the garlic, peas, and corn and cook until tender. Move the cooked veggies to one half of the pan and crack the eggs in the other half. Scramble the eggs and then mix together with the vegetables. 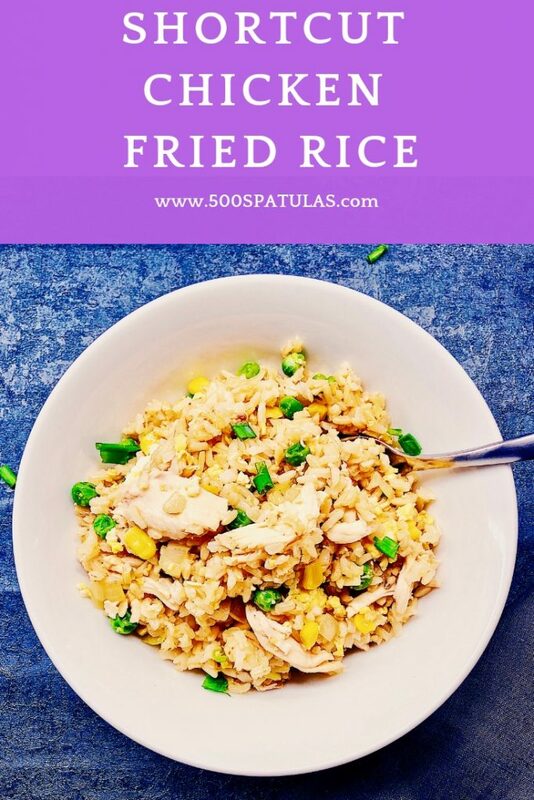 Add in the chicken, rice, and soy sauce and toss to combine. Let cook for 1 minute. Garnish with chopped scallions and serve warm. In a large skillet, heat the sesame oil and olive oil over med-high heat. Add the onion and sauté for 2 minutes. 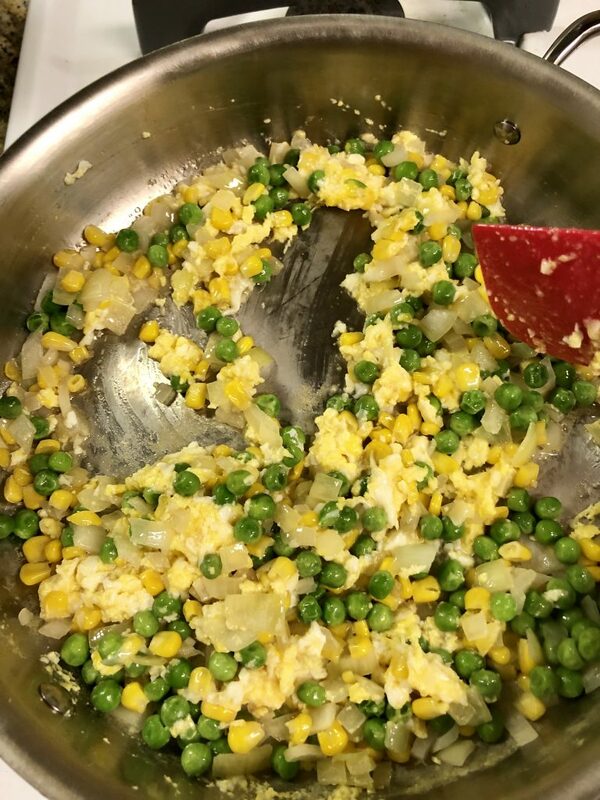 Add the garlic, peas, and corn and cook until soft. 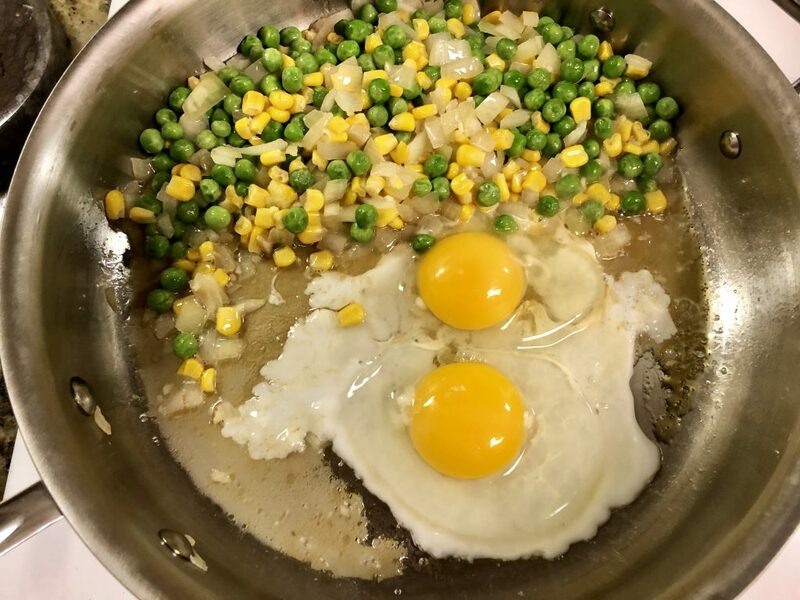 Move the cooked veggies to one half of the pan and crack the eggs in the other half. Scramble the eggs and then mix together with the vegetables. 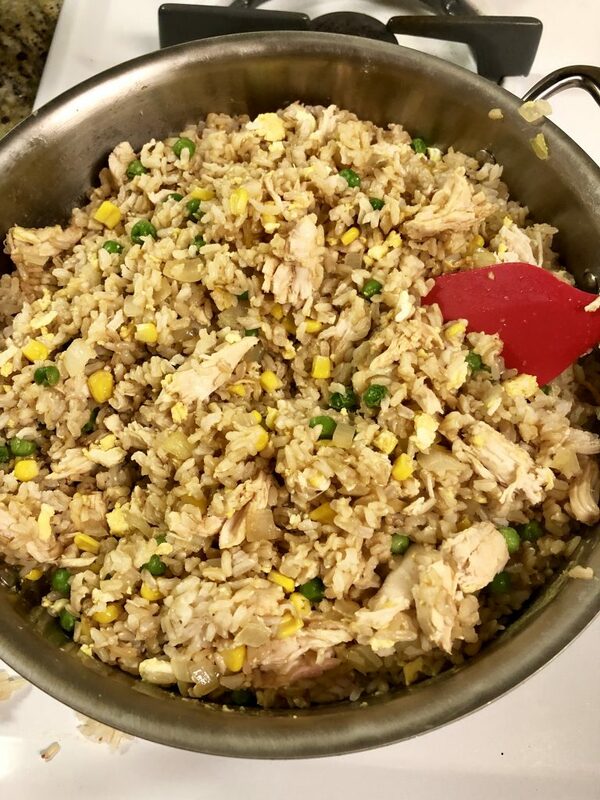 Add in the chicken, rice and soy sauce and toss to combine. Let cook for 1 minute. Garnish with chopped scallions and serve warm.